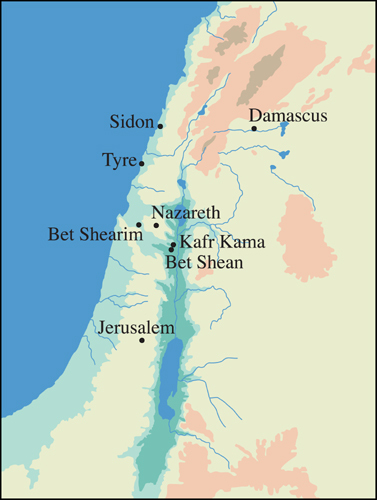 This map shows where examples of hexagonal juglets and jars decorated with “True Cross” relief panels have been found thus far. There has been much discussion about who was making these six-sided vessels. Some literary evidence suggests that glassworking in the eastern provinces was mostly a Jewish craft; hence the existence of several hexagonal vessels from Jerusalem the panels of which are decorated with Jewish motifs, including the menorah. The occurrence of the "lozenges and dots" motif on both Jewish and Christian flasks is therefore intriguing. It suggests that Jewish glassworkers catered to the needs of Christian pilgrims as a matter of commercial practicality; as a logical extension of their market that simply could not be ignored, whatever religious animosities they might have felt towards these visitors.